I don’t share a whole lot of details here on the blog about dear hubby, my children, my siblings and other family members, mostly due to that whole privacy thing. This is the way they prefer things and I respect that. My pets, however, don’t seem to mind when I share about them and I never have to worry about saying too much, not enough or the wrong things. I don’t call our family pets fur children like a lot of pet owners do, although come to think of it, dear hubby does refer to dear daughter’s pets as our grandchildren. For some reason the words fur babies/children just don’t feel right to me, but there is no doubt about it, our pets are family. Without a doubt they are loved deeply, pampered and yes, spoiled; but why not, right? Recently, it occurred to me that I have written and shared a post about a little black and white kitty named Ninja and one about how an older dog is an extra special dog. But I haven’t yet written and shared a post about our middle “pet child,” Sophie. 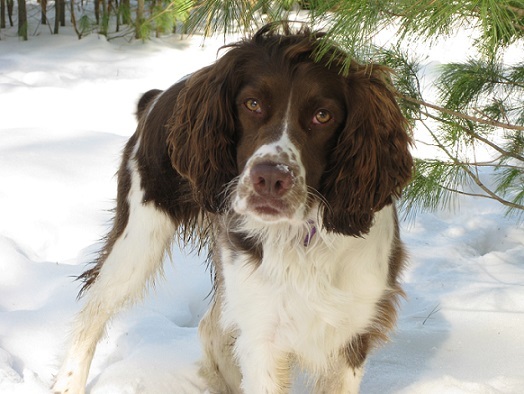 Sophie is a liver-colored version of an English springer spaniel and a fine example of the breed. Of all the dogs we’ve had, I’d categorize her as the most “normal” one, whatever that means. Her disposition is sweet, mild-mannered yet spirited and exhibits a healthy dose of strong-will thrown in to keep us on our toes. She loves her humans deeply, but also has interests of her own to nurture and maintain. She’s not the worrier like our goldens have tended to be and, of course, keeps a close eye on everyone’s comings and goings; but at the same time, doesn’t feel obligated to stick like glue to whatever favorite human is in sight. Sophie has her own life, too, and I find myself ‘respecting’ her for this attribute. This energetic, furry package of unconditional love is an endearing blend of cuddler, tracker, sprinter, leaper, jumper, digger (she’s dug some impressive holes in our yard), protector, and yes, sometimes barker. She is a wonderful, kind-hearted companion and it is virtually impossible to look at her “smiling face” without instantly feeling better. And of course, Sophie was there (as was Elsie) during my mother’s illness, death and then my own cancer diagnosis. I have written about those times before, and likely will again. When I was thinking of how best to describe this sweet, furry, four-legged member of our family, the one word that kept coming to mind was exuberance. Sophie does everything with exuberance. She runs, springs, wags her stump-of-a-tail, tracks, eats, loves, even sleeps (she snores) with exuberance. There is no half-way of doing things where Sophie’s concerned. Whether she’s running umpteen laps around our yard, “climbing” trees attempting to get closer to those pesky squirrels who relentlessly tease her, or sleeping like a collapsed rag doll in a family member’s arms, she gives it her all. No doubt about it, Sophie lives and loves with exuberance; not a bad way to do both. Do you (or did you) have a special pet? If you have a pet (or did), what one word best describes her/him? Yes! Did you know that today is National Love your Dog Day? It’s true. Google it. I was gifted a Golden puppy from a breeder friend after my 12 year old Golden died. He had cancer and didn’t let on until two days before he died. This little puppy was born on the very same day. It was kismet. Six months later, I was diagnosed with my breast cancer. Thank goodness I had this little terror of a puppy to keep me company, as well as keep me distracted, during my illness. Kim, I saw that on the news today actually. I did not know until then. Good timing for this post I guess. Gosh, what an incredible chain of events. Thank goodness indeed that you had your sweet pup to keep you distracted during your illness. Distraction is a perfect word. You can share a pic on my Facebook page under the post. Thank you for sharing about both your special pets. My whole life is an incredible chain of events! What’s you FB name? Kim, My facebook page is called Nancy’s Point too. Here’s the link. https://www.facebook.com/NancysPoint I’d love to see your dog’s pic there. Lindsay, Thanks for reading. She is a good girl. I have Maggie and Molly, they are very attached to me, and I kinda of like it that way. 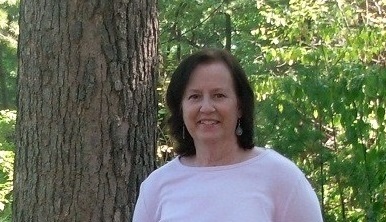 I remember coming from my mastectomy, typically they are jumpers, but that day , not at all. They make me smile everyday . Tammy, Your Maggie and Molly sound very sweet. Isn’t it amazing how they seemed to just know they shouldn’t jump up on you that day. Dogs can sense things like that sometimes. Reading your comment made me smile. Thank you. Ha ha, yes goldens are worriers, why is that? Right now, I am sitting for a crazy German Shep who is older than 1, but still very “puppy”! But he’s been so good in our snow/ice storm (unusual for our area) this week (grr, I’m a beach girl). He uses his mouth to “hold my hand” while we walk. His siblings, a Westie, a Yorkie, a tabby cat, and a black cat, are not as understanding–they just want dinner–earlier and earlier each day, I get the “stare”. Oh well, that is the variety of breeds and pets. Love it. CC, Goldens become so attached to their people and would do anything for them. Must be part of their ‘wiring’ I guess. Our golden sticks like glue to the people in the house. Sophie does too when she’s not busy with other things. Sounds like an interesting group you are sitting for. It’s cute how the German Shepard ‘holds your hand’. And boy, do I know about that stare you speak of! I love the variety of dog breeds too, including mutts. Do you have one of your own? I forget. I LOVED this post. What an exuberant dog, indeed! Sophie is soooo cute and was an adorable puppy. Thank you for sharing posts about your pets. I love my cats, and while I also don’t call them my fur babies, I do call my brown tabby my baby. I love both my cats equally, but my brown tabby really pulled me through cancer diagnosis and treatment. She knew I was ill; I strongly believe it. There’s a history with me and her. She sleeps with me every night, all night. A very loyal companion. Thanks again for this post; it made my day! Beth, Your comment made my day. As you well know, our pets are so special during the good times and the bad. I’m glad you loved the post. Thank you, dear friend. Linda, Oh my, your comment tugs at my heart… I am so sorry about your parents and I am so sorry your beloved pet is no longer with you. It’s so hard to let them go, but I’m glad Abby didn’t suffer and died having you and your family right there with her. I understand your devastation and grief. Pure love, that’s exactly what our pets offer. What a wonderful way to put it. Again, I’m sorry. Thank you for sharing about Abby. 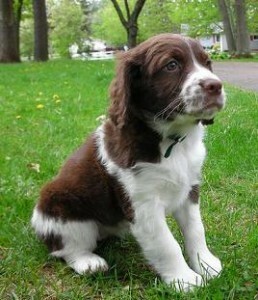 I have an English Springer Spaniel named Edie. She looks a lot like your Sophie. She just turned 8. She is the love of my life. I was diagnosed stage 4 from the beginning 6 years ago and when I was first diagnosed and soon after had my mastectomy and many surgeries that followed, she was by my side. She was a crazy 2 year old but around me she was so gentle. It was like she knew. She has also been my secret keeper. On those bad days when I’m in pain or very tearful, Edie always comes and sits near me.. I wouldn’t have made it this far without her constant love and caring. Lisa, I love that name Edie. Sometimes our pets do sense the seriousness of a situation. I just know it. It’s so wonderful Edie has been there for you through all that. Your last sentence says it all. Thank you for sharing about your dear pet.